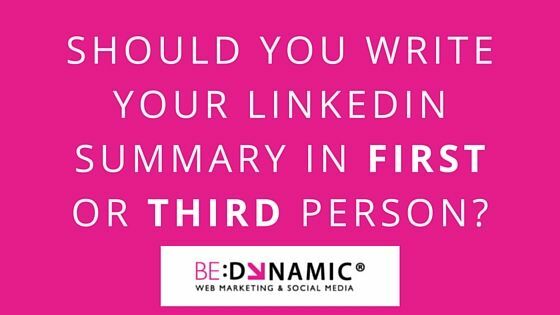 Should you write your LinkedIn summary in first or third person? Do you have a LinkedIn profile? If not, you should. I am a firm believer that everyone over the age of 16 should be using LinkedIn. You might ask the question, why 16? Did you know that recruiters and colleges are looking at LinkedIn to help make decisions on candidates? Imaging being up against a candidate that was rocking LinkedIn and you didn’t have a profile. As a business I know who I would favour. So now that you have a profile, you need to write your LinkedIn summary. A questions I always get asked when out with clients or with training groups is; should I write in first or third person? Before I get into that, let me tell you a little about me. Sandra is a digital marketing consultant, trainer and lecturer that has a passion for all things digital. Her main specialisms are SEO and social media but can work with you to create and implement a full, all-encompassing digital marketing strategy……. Now doesn’t that sound strange. I am giving you a summary of me but writing it at a distance, using Sandra and she and distancing myself from it. Don’t ever forget that you are a person with your own voice trying to reach out to other people. Use your voice. Tell them how you can rock their world by connecting or doing business with you. Now there is a word scares some people. A strategy is really your plan. Think about why you are using LinkedIn and what you are trying to achieve? Are you trying to connect with specific people? Are you trying to build credibility with your clients or people in your industry or both? Now think about what you need to tell these people about you that will appeal to them. Why should they hire you / your company vs your competitor? What makes you different / better than everyone else? What will they get out of the relationship? Slideshare is a brilliant website that you can use to share documents, presentations etc. Every document you upload can be easily shared across to your LinkedIn summary with the click of a button. Share documents that back up what you are saying in your summary. For example: my summary says that my ethos is to help companies manage their digital marketing in-house. To help show this I share a few templates that help businesses to plan and implement their digital marketing strategy. These templates are updated regularly so each time I update them and re-share them my network is made aware of it. This just goes that extra step to show people what I am all about and how I will help them. Share your successes or at least mention some of the clients you work with (becareful not to breach client confidentiality). Share in a way that shows your strengths but do not make it look like you are bragging. No one likes a big head. Remember your strategy. For example, if you want to work with big corporates listing SME clients may not appeal to them. So there you have my top 8 top tips on how to write a good LinkedIn summary. Are there things that you think I should have included in my list?